I want to finish this all too summary account with the only wall painting Gleizes actually realised, though strictly speaking it was, as a fresco, executed under his supervision by a team of specialists in fresco painting based in Lyon. It was commissioned by members of the Jesuit order based in Lyon for a new seminary in Chantilly. At the time of his confirmation Gleizes had been associated with the Benedictine monastery of St Marie de la Pierre-qui-Vire where his pupil, Dom Angelico Surchamp was to launch the extraordinary Zodiaque series of book on Romanesque art. But he had also fallen in with a group of Dominicans and seemed well placed to profit from the interest in promoting a connection between modern artists and the church which was being promoted by the priests Pie Raymond Régamey and Marie-Alain Couturier and their journal L'Art sacré. 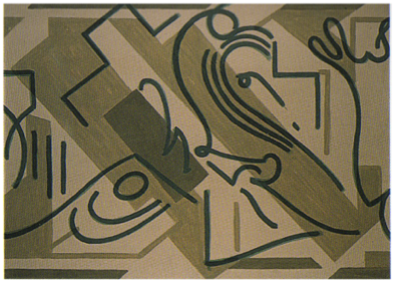 There is no room here to tell the story of their falling out but it had to do with Gleizes's reticence with regard to the philosophy of St Thomas Aquinas, which he regarded as a symptom of the same phenomenon of decline - culture to civilisation, spatial to rhythmic, abstract to empathy - as the development of single point perspective in painting. Gleizes found a more sympathetic hearing among the Jesuits who in Lyon were reviving interest in the pre-Thomist early Fathers of the Church, the group who were engaged in the ambitious publishing project Source chrétiennes, pioneers of the Ressourcement - the tendency we associate nowadays with Joseph Ratzinger, the future Pope Benedict XVI. The painting is a meditation on the Eucharist - the circular Host in the centre flanked by emblems of the Old Testament (the Sacrifice of Isaac) on the right and the New Testament (the Good Shepherd) on the left. 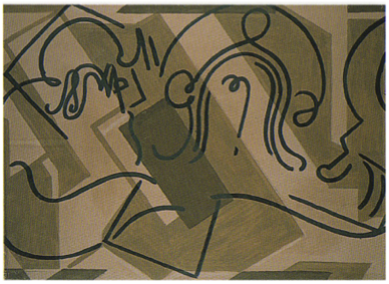 The figuration reflects a new research Gleizes was involved in at the moment of his death - the arabesque, a line which, apparently free, is still structured by an underlying translation/rotation. In his earlier thinking the figuration had belonged to the static, space based, rectilinear construction of the painting which gave rise to a mobile non-figurative circular or spiralling movement. Now the figuration appears as a phenomenon thrown up by the free, bounding mobile line. As also here in another mural decoration destined to be unrealised, this time a Stations of the Cross for a proposed industrial estate at La Ciotat, near Marseilles (the workers' union objected to the waste of money involved in building a church). In conclusion I would like to affirm my view that Gleizes's discoveries in pictorial construction - the principles of translation-rotation and of the organisation of colours in the order of the rainbow - have a strong objective value and that they can and should be used by other artists coming after him. But nearly everyone who has engaged with these principles has felt that they have a quality that can only be called 'religious', 'spiritual' or 'contemplative'. 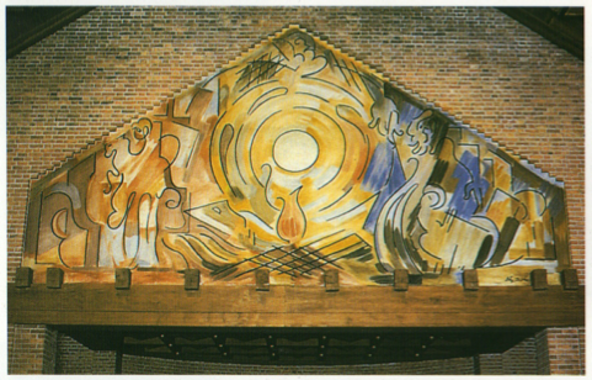 This poses the question of their possible use as a liturgical, church art and this in turn, in a Christian context, poses the question of how these essentially non-figurative principles can inter-relate with a religious imagery - in an Orthodox context a highly disciplined imagery facilitating a relationship of veneration with the person or with the scene that is being depicted. I don't believe that a satisfactory solution has yet been found to the problem despite many impressive achievements along the way, but I do believe it is a problem that is worth tackling. Indeed I believe that to be faced with a problem of such an order is both a responsibility and a privilege of the highest order.